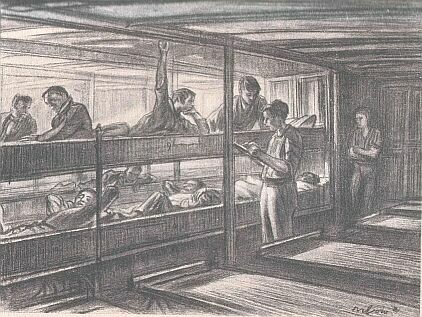 The boat here is an old one; in newer boats the accommodation is finer, but the drawing shows the ordinary mode of bedding the patients in double tiers of continuous bunks. At some point in the passage an R.A.M.C. orderly asks every patient to what part of "Blighty" he belongs, and an effort is made to send him to a hospital near his home. The orderly's approach, as he makes his rounds, is always eagerly awaited throughout the ship by the wounded men.